Delhi, our country’s capital, is situated on the banks of river Yamuna and is India’s most populous city, next to Mumbai. 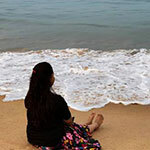 Delhi is often referred to as “the city with the beating heart”. It is a unique amalgamation of diversity, traditions, architectural wonders and cultural practices. 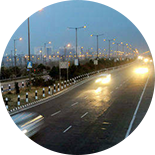 Considered as one of the fastest growing cities in the world, Delhi is also one of the oldest existing cities. This place is now a commercial hub to witness; you will come across innumerable tourist attractions and places that would interest you. This is why Delhi has a flourishing tourism industry; where thousands of visitors from all around the world come here to explore the magnificent colors of Delhi. In Delhi, you can notice realities of different times merely a metro ride away from each other where you can find barefooted laborers on the dusty streets of Chandni Chowk and skyscraping offices with high-street fashion outlets in the glitzy Gurgaon. City that belongs to everyone!! Delhi, a treasure trove of history, has been the centre of power and supremacy ever since India’s history can date back to. In preseent day it is the home of executive, legislative and judiciary heads of the Government of India. 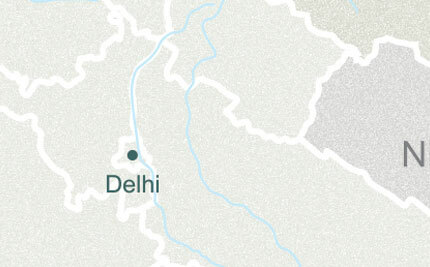 This state has been demarked into 6 districts, namely South West Delhi — Defence Colony, Hauz Khas, Green Park, Greater Kailash, Vasant Kunj, Lajpat Nagar, Nehru Place, Malviya Nagar and Kalkaji; East Delhi — Gandhi Nagar, Preet Vihar, and Vivek Vihar; North Delhi — Sadar Bazar, University Enclave (Kamla Nagar), Kotwali, and Civil Lines; West Delhi — Patel Nagar, Rajouri Garden, East Sagarpur and Punjabi Bagh. ; Central Delhi — Connaught Place, Khan Market, Chanakyapuri, Karol Bagh and Paharganj, And the Old Delhi - Daryaganj, Kashmere Gate, Chandni Chowk, Chawri Bazaar, Lal Quila and Jama Masjid. Apart from these, the cities of adjoining states Haryana & Uttar Pradesh, like Gurugram, Noida, Faridabad and Ghaziabad are a part of the NRC (National Capital Region). Delhi is a melting pot of diverse cultures, glorified history, art, music, literature and more. Heritage in Delhi is a luxurious journey back to time. The Red Fort, also referred to as the ‘Lal Qila’ in Hindi, is one of the most frequented tourist attractions in Delhi by foreigners. It is a UNESCO World Heritage Site and was built by the late Mughal Emperor Shah Jahan in the 17th century. It is the site for India’s extravagant Independence Day Celebrations. Near to it is the Jama Masjid, a site for solace amidst the hustle of Old Delhi. It is India’s largest mosque and was the last architectural wonder constructed by Shah Jahan. When you look from the top of the southern minaret, you will notice how Connaught Place, Sansad Bhawan and Jama Masjid are built in a straight line, owing to the brilliant mind of the architect Edwin Lutyens. Central Delhi houses the pride of India, India Gate. Situated at the center of Delhi, it bears a striking resemblance to its French Counterpart, the Arc De Triomphe. It was originally referred to as the All India War Memorial. The monument serves to commemorate 70,000 soldiers of the Indian Army who lost their lives during the World War I. Qutub Minar, Qutb Minar is another UNESCO World Heritage Site in the southern part of Delhi. Its construction was initially commenced by Qutab Ud-Din-Aibak and later on, completed by his son Iltutmish and Firoz Shah Tughlaq. 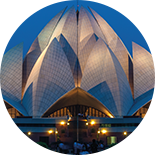 Even the modern day Lotus Temple, known worldwide for its flowerlike shape, it is a major attraction of Delhi. It is a Bahai House of Worship that was dedicated in the December of 1986. The building is constructed of 27 free-standing petals of marble and is a delight to the eyes. Contrary to the popular notion, adventure sports are actually not an uncommon sight in Delhi. 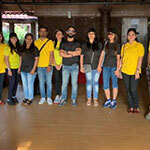 A number of adventure camps and organizations have come up to serve the adrenaline rush of Delhites. Head to Aravali Mountains for rock climbing and zorbing. You could also partake in activities such as Bungee Jumping, Trampoline, Hot Air Balloon Ride and Paramotor. For nature lovers, the Fauna of the region can be referred to as oriental and is varied and fairly rich. There are carnivorous animals found here: hyenas, wolf, fox, jackals and leopards. The rodent family in Delhi is huge and consists of rats, squirrels, cats, monkeys and dogs. Monkeys are also found in large groups in Delhi. Talking about various kinds of birds in Delhi, the house sparrow and common crows are the most commonly spotted one. As a cosmopolitan city, Delhi is an adobe of all religions. Hindus, Muslims, Sikhs, Christians, Jains and Jews, all live in harmony. There are a number of religious places in and around for tourists to visit. Gurudwara Bangla Sahib is located in the heart of Delhi - Connaught Place and is one of the most famous Gurudwaras in the country. It is known over the world for its “Sarovar” i.e. the pool inside the building complex. It was originally constructed as an abode for Raja Jai Singh and now serves as an iconic place of reverence for the Sikh community. 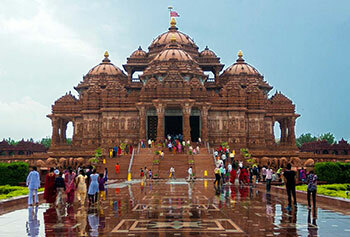 The Akshardham Temple is near Noida and was recently constructed in 2005. Built out of pale red sandstone, the lavish temple also includes a boat ride that floats through 10,000 years of Indian history and musical fountains. The deeply revered Hazrat Nizamuddin Auliya Dargah is situated in the Nizamuddin West area in Delhi and is frequented by thousands of devotees and curious tourists each week. It is the mausoleum Khwaja Nizamuddin Auliya, a famous Sufi Saint of the 13th century. Amongst Hindu temples, Sri Kilkari Bhairav Temple or Bhairo Temple at Purana Qila (Old Fort), ancient Hanuman Temple in CP, Jhandewalan Mandir of Goddess Durga, Shri Jagannath Mandir is situated in Hauz Khas, Goddess Katyayani temple at Chhatarpur, the 1764AD Kalkaji temple dedicated to Goddess Kali/Shakti, ISKCON temple situated on Hare Krishna Hill in East of Kailash in Delhi, the Digambar Jain Temple on the main Chandani Chowk Road and the Uttara Swami Malai Mandir in R.K.Puram are very popular. Delhi is known to be a melting pot of different cultures over ages, so is its fairs, festivals, food and language. There are a number of fairs and festivals hosted in Delhi that reflect the heterogeneous culture of the lively city. Some of the most famous fairs and festivals hosted pompously in the capital city are the Surajkund Crafts Mela, International Trade Fair, International Mango Festival, Delhi Auto Expo, National & International Book Fairs, Phoolwalon ki Sair, National & International Auto Expo, Walk the City fests, Literary Fests, Spring Fests, Food Fests, and more. Places like Delhi Haat, Dastakar Haat etc., are places that celebrate craft & food festivals all through the year. When on Delhi, never miss the food. Delhi cuisine consists of various types of dishes that are mostly regional because it is inhabited by people from different states. Since Delhi was a kingdom held by many dynasties, different rulers introduced different types of cuisine. There are a number of options available here including fine dining options from varied cuisines: Chinese, Continental, Thai, Mexican, Mughal, South Indian and North Indian preparations. Another mouth-watering option here that is a Delhi trademark is the street food such as Golgappa, Papdi Chaat and Momos. Any shopper’s delight, Delhi is a heaven to shop. From handlooms & handicrafts to exclusive brands & from the local street shopping at chandni chawk & lajpath nagar to plush designer boutiques in luxurious malls, Delhi has it all. New Delhi is popular for its thriving street market culture, where everything from handicrafts and clothing to accessories and jewelry is sold. Some of the most famous markets that one should visit in Janpath, Palika Bazaar, Sarojini Nagar, Delhi Haat, Tibetan Market and Kamla Nagar. 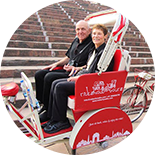 The best seasons to visit Delhi are October to March and Hindi is the language by mass. Travelers find it easy to communicate as English is easily understandable and people are responsive. We are a responsible travel company, recognized by the government and we ensure to develop & deliver best of holidays to our guests.